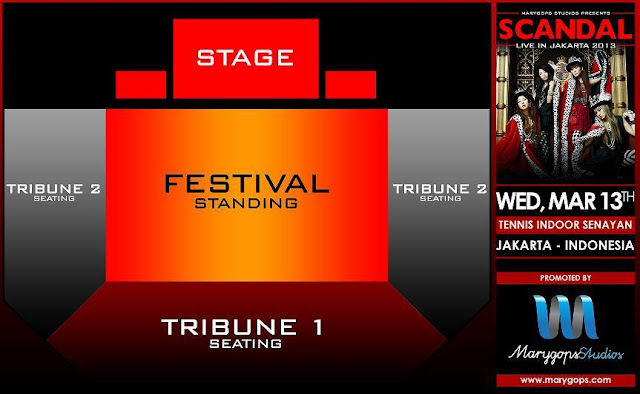 It had officially announced by Marygops Studio (the one who bring L'Arc~en~Ciel to Indonesia) that Scandal will hold their first live performance in Indonesia on 13 March 2012 in Tennis Indoor Senayan. Yay!! This is the seating plan! What? You don't know who Scandal is? They're an all-girl Japanese Rock Band. I first know about them because they sing one of the Bleach anime opening theme and I think they're quite good. The ticket price will be announce soon. For more information, follow the promoter at their official twitter account. I will keep you inform. So in 2013, there will be Scandal and JRock Evolution in Indonesia ^^. All J-Rock fans in Indonesia, save your money from now on!! !